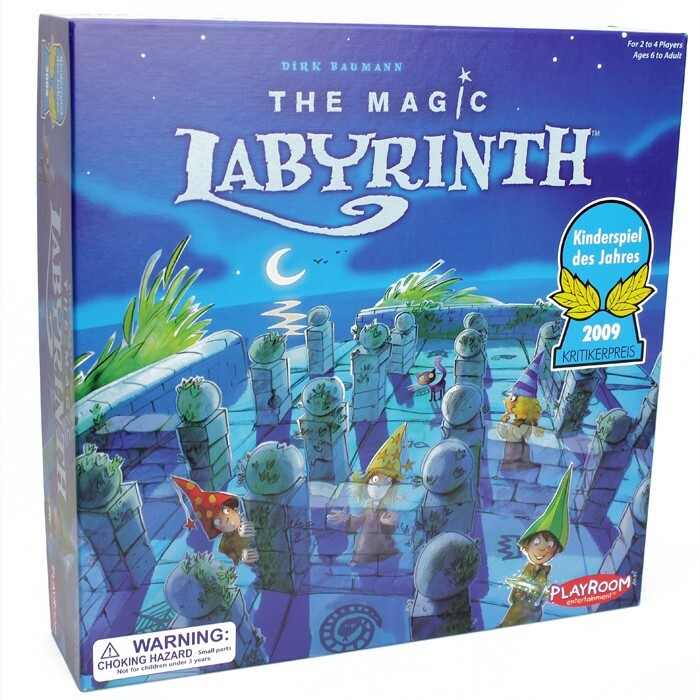 Overview: The Magic Labyrinth uses a clever board and magnets to simulate invisible walls in a labyrinth. Players move about, collecting the magic symbols while trying to avoid the hidden walls. Rating: Great—and not just for little kids. Who Will Like It? Though it’s rated for 6 and up, this game, like The Amazeing Labyrinth, is one that parents won’t mind playing as well. 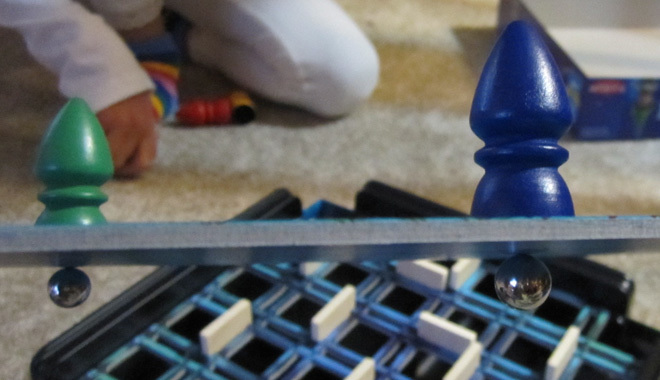 If you like clever uses of magnets, you’ll probably like The Magic Labyrinth. The story here is that the big wizards like to play pranks on the little wizards by creating invisible walls—and the board does give a magical feeling of invisible walls. As for why little wizards are running around looking for magic symbols, well … okay, that’s harder to explain. The game comes with four chunky wooden pawns (with magnets inside), four metal balls, a wooden die (which only goes from 1 to 4), 24 magic symbol chips (cardboard punch-outs), 24 wooden walls and cloth bag for the symbols. The box itself also serves as a crucial part of the board. 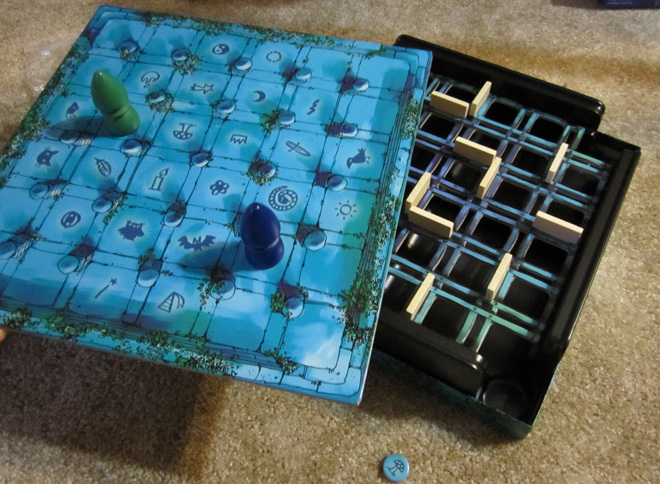 The board is very cleverly designed: the black plastic base has four wells which direct dropped marbles to the four corners, where there is an opening. On top of that is a cardboard grid with holes—this is where the wooden walls are placed. Finally, on top of all that is the board itself, which covers up the walls entirely. The pawns are placed in the corners, with the metal balls underneath. As you move the pawns around, when you encounter a wall you’ll feel the click and then hear the marble drop down. At the beginning of the game, one magic symbol is drawn from the bag and placed on its matching spot on the board. Players take turns rolling the die and attempting to get to the symbol. If you hit a wall and lose the marble, then you head back to your starting corner. Each time a symbol is collected, another one is drawn from the bag and placed on the board. The first person to collect five symbols wins. The construction of the game is ingenious, and the customizable maze makes it great for replayability and also adjustable levels of difficulty. Even for adults it can be quite difficult to remember exactly where walls were—and if you’re traveling into unknown territory, you just have to cross your fingers and take a guess. The rules state that you’re not allowed to “test” for walls—you just have to pick a direction and move swiftly. However, when we play with our kids we let them feel around if they want, just to give them a bit of a handicap. There’s one weakness, in my opinion, which can be easily overcome with a house rule. The fact that everyone is going for the same symbol means that it’s quite possible for one player to be much closer to the target than everyone else. And if you draw a symbol that somebody is already standing on, they get that one for free. I prefer the way Amazeing Labyrinth works, where each person has a target number of symbols and must reach them all in the correct order to win. There’s still luck involved in the placement, but at least there’s more of a chance that your route will take you all over the board, rather than just collecting the ones that happen to be near you. Either way, though, The Magic Labyrinth is a clever idea and the execution is fantastic. It’s no wonder that this won the prestigious Kinderspiel des Jahres (Children’s Game of the Year) in 2009. Wired: Magnets + mazes = magical fun. Tired: Sometimes luck plays too strong a role; I suggest tweaking the rules a bit.